Cartoon comedy 'Gravity Falls' reflects a changing approach to programming. A creator-driven mind-set is attracting new talent to the network. In "Gravity Falls," twins encounter swooping pterodactyls and plotting gnomes in Oregon. "Gravity Falls" doesn't sound like classic Disney animation. The new cartoon comedy series follows twins Dipper and Mabel, whose school vacation plans are dashed when their parents ship them off to spend the summer with cranky old Uncle Stan in Gravity Falls, Ore., where pterodactyls swoop overhead and gnomes plot to abduct Mabel and make her their queen. "Disney wasn't the first place I would have thought of going to," said the show's creator, Alex Hirsch, who grew up watching Fox's irreverent animated comedy "The Simpsons." But the Disney Channel is where the show will debut in June. 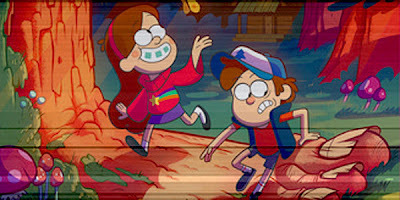 "Gravity Falls" is loosely based on the summers that Hirsch and his twin sister spent camping in Northern California with their great-aunt Lois — minus the gnomes and pterodactyls and "all the magical strangeness I wish would have happened." The imaginative series is among the new animated projects highlighting the Disney Channel's television upfront presentation to potential sponsors Tuesday in New York City. Disney television animation struggled for years to find success, despite founder Walt Disney's place in the cartoon pantheon. The Disney Channel's breakthrough began in 2007 with "Phineas and Ferb," a concept other networks rejected as too odd and too complicated — the geometric shapes of the characters' heads gave the series a radical look, and its intersecting plot lines were deemed too difficult for children to follow. The series' success proved the skeptics wrong and became a creative inflection point for the Disney Channel and its network sibling, Disney XD, which have emerged as magnets for top-flight talent. Producer Craig McCracken, creator of the Emmy award-winning animated series "The Powerpuff Girls" and "Foster's Home for Imaginary Friends" for Cartoon Network, has taken his latest project to Disney. His new TV series is "Wander Over Yonder," a comedy about an intergalactic traveler named Wander and his steed, Sylvia, who travel from planet to planet helping free people from the oppression of the evil Lord Hater and his army of Watchdogs. McCracken isn't the only eminent TV animation veteran to migrate to the house the Mouse built. Emmy-winning artist and director Paul Rudish, whose credits include the Cartoon Networks' "The Powerpuff Girls" and "Dexter's Laboratory" and Warner Bros. Pictures' "Star Wars: Clone Wars," has a deal with Disney Television Animation. Charlie Bean, former creative director of the Cartoon Network's U.K. studio, is executive producer of the forthcoming animated Disney XD series, "Tron: Uprising," based on the 2010 Walt Disney Studios' sci-fi film, "Tron: Legacy." Mike and Matt Chapman, creators of the popular Internet cartoon "Homestar Runner," also have a development deal with Disney. "A lot of the talent that had been part of Nickelodeon and Cartoon Network have embraced this new style of development that's happening at Disney," said Zac Simmons, a Kaplan Stahler literary agent who represents writers in film and television animation. "They've created this cool culture for themselves." Gary Marsh, president and chief creative officer of Disney Channels Worldwide, said that by taking creative risks, the network has been able to connect with audiences. "By creating a broad slate of programming that is unique as it is diverse — animation, live-action, series, movies, even unscripted reality... we are not only creating ratings success," Marsh said by email, "but we are amplifying the level of engagement our audience feels with our content and our characters." The Disney children's network once was perceived as a place of infinite hurdles, where new projects had to be "reverse engineered" to fit the studio's strict template, Simmons said. Now, he added, the Disney Channel has become "the first stop, not the last stop," for the writers he represents. Simmons and other animation insiders credit Eric Coleman, the15-year veteran of Nickelodeon who had championed such hits as "SpongeBob SquarePants" and "Avatar." He was recruited by Marsh in January 2008 to serve as senior vice president of original series for Disney Television Animation. Coleman transformed the culture into one that is creator-driven, said author and cartoon producer Jerry Beck, who edits the animation-centric website Cartoon Brew. The executive has reached out to his personal network of animation talent, inviting creative types to bring him the projects they previously wouldn't have shown Disney, Beck said. "Before Eric got there, [Disney Channel] had a couple of mild hits, like 'Kim Possible.' They were doing derivative things. They were following trends," Beck said. "Now, they're leading trends." "...a place of infinite hurdles, where new projects had to be "reverse engineered" to fit the studio's strict template..."
--is dead-on. Having worked for nearly a decade on numerous TVA projects as a writer, story editor, and producer, I watched as the studio hamstrung creative thought and originality while at the same time chasing after Nickelodeon and Cartoon Network style shows-- but not striving to create original, Disney product that didn't feel like watered-down efforts to be like "the other guys". Okay, this is a broad brush I'm painting here. And in fairness, I've worked with some awesome, extremely creative executives who were just as frustrated by the corporate constraints as I (and others) were. To a certain degree I understand this, the Disney brand and name had to be protected. But there's no reason why that brand can't be pushed, expanded, and updated. Finally it's starting to happen. And that's good. "Before Eric got there, [Disney Channel] had a couple of mild hits, like 'Kim Possible.'" I would take issue with this comment. Yes, I was on staff, writing for the last 3 seasons of Kim Possible so I'm extremely biased--- BUT... in the scope of the Disney Channel's animated series, Kim Possible was NOT simply a "mild hit". It was one of (if not the first) animated series to air on the Disney Channel. It had (and still has) a large, and extremely loyal, following. So much so, that over a year after Kim Possible was cancelled, the Disney Channel brought it back for a 4th season because the fan pressure was so great. If you know Disney, they never bring anything back like this. So this was a big, big deal to have happen. There was even a live action feature in the works at one point, but then internal studio politics nixed that and it became the animated TV movie, So the Drama. To brush off Kim Possible as little more than a footnote in the pantheon of Disney Television Animation is insulting to the show's creators (Bob Schooley and Mark McCorkle) - especially when KP was a first step in animation for the Disney Channel and a hit whether Mr. Beck feels it was or not. The implied sentiment that Disney Television Animation never really had any cred in the game of children's animation until Phineas and Ferb is laughable and insulting to the hundreds of artists, directors, producers, writers, and executives who created The Disney Afternoon block of shows back in the early 90's (the birth of Disney TVA). Shows like: Duck Tales, Rescue Rangers, Darkwing Duck, Goof Troop, Aladdin, Gargoyles, and Timon and Pumba. Yes, this is all ancient history, but history none-the-less that help build Disney's library of cartoons, employed thousands of people, entertained millions of kids, and shoveled enough money into the Disney company to make Scrooge McDuck blush. And out of this block of The Disney Afternoon shows, one series (Aladdin) helped spawn a new avenue of animation for the company--- direct-to-video. The Return of Jafar was a big hit for Disney on VHS and it helped start the home video division for the company - a division that's still running today as Disney Toon Studios. DTS operates under the command of John Lasseter and is run much like the early days of PIXAR. DTS produces Disney's Tinker Bell DVD series and the upcoming Planes DVDs and specials. I guess what I'm also struggling with is why in the hell would Disney's promotions department put forth a press-release/article that was negative toward its own product and history? That confounds me. Rather than writing an article that's meant to service the egos of a few executives, why not embrace the foundation upon which your company was built? Why make it sound like all you've ever produced in the past was pointless crap no one watched? Is that the message you want to send to current and past employees, and to the millions of viewers and fans who've watched your shows, bought your toys, visited your theme parks, and purchased your DVDs over the years? I'm betting not. It is nice to see Disney embracing new creative ideas and thinking in new ways with regards to series animation. Phineas and Ferb may mark a fresh, exciting re-boot in television animation at Disney, but it's not the first hit the company's had, just the latest. While wasting time when I should really have been working today, I stumbled across the main titles from The Pink Panther animated series I'd worked on from the early 90's. This version of The Pink Panther was my very first writing gig in animation - as a kid I'd watched the classic Pink Panther cartoons and I was definitely a fan. The 1993 series ran for only two seasons, but it was a great crew, a lot of fun, and a really nice looking show. The style of the show has a heavy 90's feel to it, but I still like the jazzy version of Henry Mancini's Pink Panther Theme that was arranged for the titles. Yes, he speaks. Get over it. The show caught flak from a lot of "Pink Panther purists" since MGM made the decision to have the Panther speak. 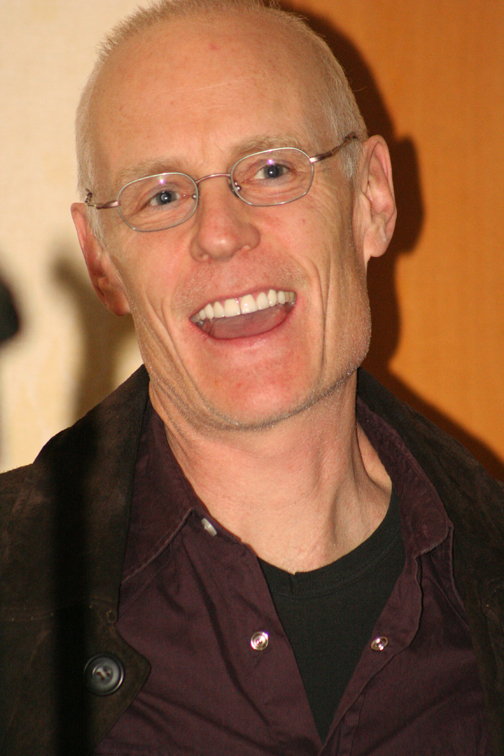 I have to admit I was a little doubtful about this change as well, but ultimately I think it worked out fine, especially since Matt Frewer of Max Headroom fame was cast as the voice of the Panther.